White wrapping paper, or as Removalists call it in the industry “Butchers Paper”, is ideal for wrapping all your crockery and glassware. If you use newspaper the printers ink can come off and stain your crockery, glassware and other items. However, so as not to waste wrapping paper, use newspaper for padding on the bottom of boxes and for filling in spaces in your packing. The goods will not be stained as they will be wrapped in the Butchers Paper. 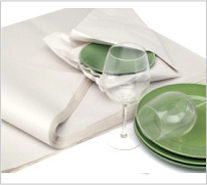 When wrapping, prepare a large area such as a table or bench top. Lay the wrapping paper flat ready for use. With dinner and bread plates, to prevent wastage, place the plate on the paper and fold the corner of the paper over to cover the plate. Place another plate of the same size on top and fold the other corner over. If there is still enough paper in that sheet repeat the process. 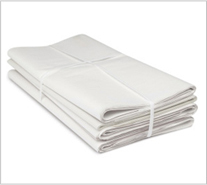 For small items tear the sheet in half and even into quarters for even Medium items. With cups, glasses and ornaments wrap each item loosely as air space between the item and the paper helps to cushion the movement. Always put heavier items towards the bottom of the box and the lighter fragile items towards the top so as not to crush and cause breakage. Packing is mostly good old common sense!